Professor Alex Novikoff will be speaking at the Medieval Seminar Series at the University of Ghent’s Henri Pirenne Institute of Medieval Studies onTuesday, May 19. The Medieval Institute, named in honor of Belgium’s most famous historian of the Middle Ages, brings established international scholars and pairs their lecture with presentations from doctoral students from the University of Ghent. Dr. Novikoff’s talk, “The Ars Disputandi and the ‘Art’ of Disputation,” reprises a lecture delivered at Fordham’s Center for Medieval Studies in September and as plenary speaker at the University of California at Berkeley’s Medieval Studies Conference in April. Dr. Alex Novikoff (Medieval History) will be delivering a 30-minute invited lecture, “Are Jewish-Christian Disputations a Source of Conversion?” at Ben Gurion University in Israel this coming week. The symposium, entitled “Debating Conversion in Different Historical Contexts,” from 26-29 May, is the inaugural conference at BGU’s new Center for the Study of Conversion and Inter-Religious Encounters, a project sponsored by I-CORE (Israeli Centers of Research Excellence). Dr. Alex Novikoff will be delivering an invited lecture at Cambridge University this week at a symposium devoted to “Ancient and Medieval Jewish-Christian Disputations: Fiction and Reality.” The event is sponsored by the Woolf Institute for Jewish-Christian-Muslim relations, the University of Paris I (Sorbonne), and Lucy Cavendish College (Cambridge). 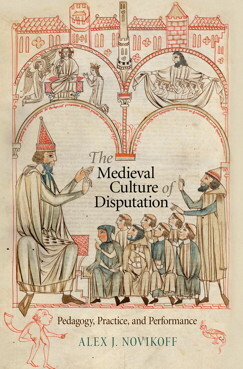 The title of his presentation, “The Role of Petrus Alfonsi in the Medieval Culture of Disputation,” is related to his recently published book, The Medieval Culture of Disputation: Pedagogy, Practice, and Performance (Philadelphia: The University of Pennsylvania Press, 2013).